1932. Exhibit at Motor Museum of Western Australia. 1950. Reg No: GNR 272. 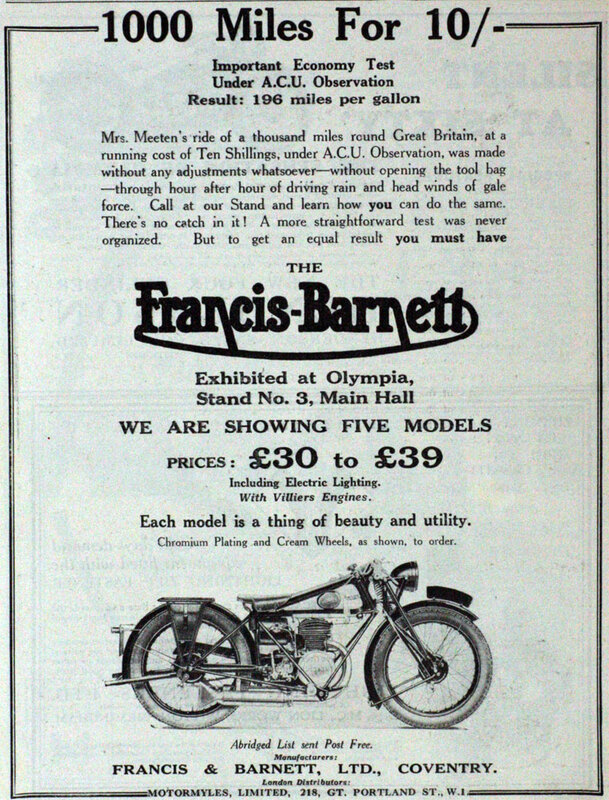 Francis-Barnett of Coventry were producers of motorcycles from 1920 to 1966. 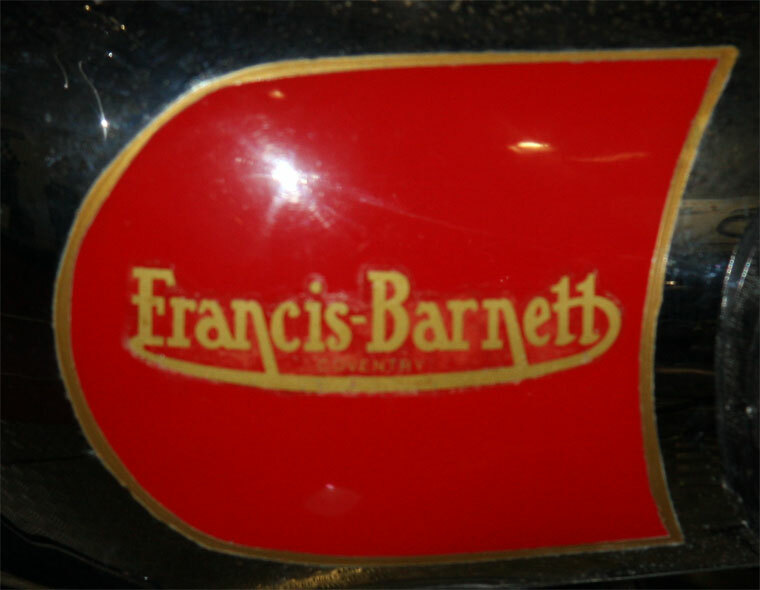 Affectionately known as the Fanny B, Francis-Barnett specialized in making economical and lightweight roadsters. They moved into the former Excelsior works in Coventry when that company moved to Birmingham. The company was founded in 1919, by Gordon Francis (whose father, Graham Francis, was co-founder of Lea-Francis) and Arthur Barnett of A. Barnett and Co, his father-in-law, at Lower Ford Street, Coventry. The new Francis-Barnett was effectively an Invicta from A. Barnett and Co, with a different tank transfer. 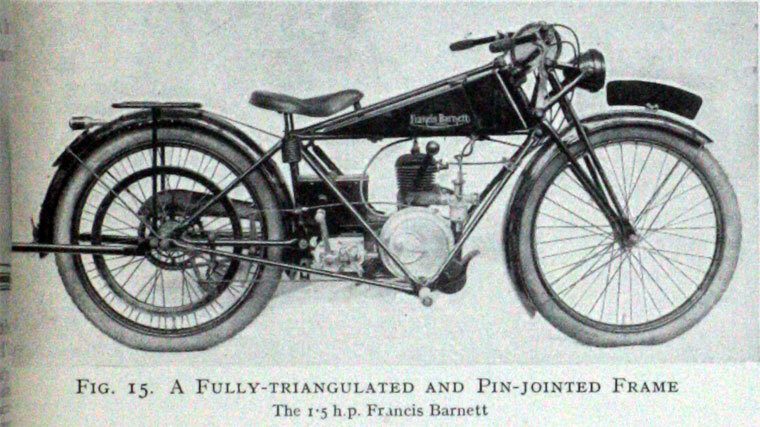 This continued until Arthur Barnett adopted the bolted-tube frame design. 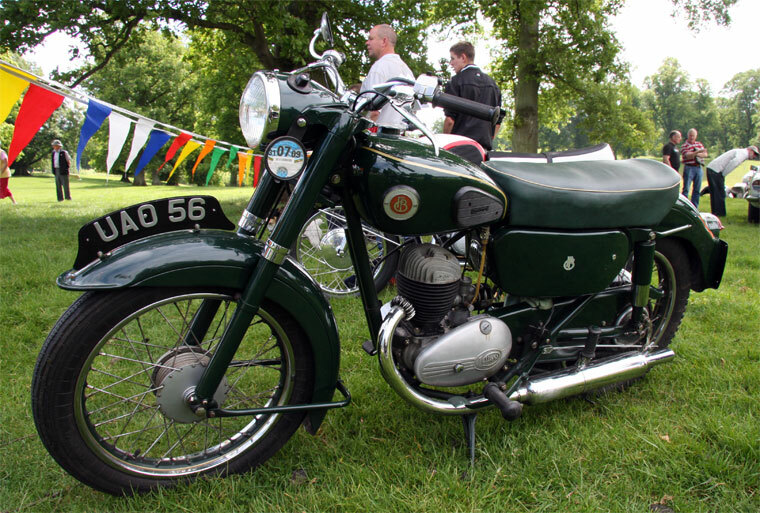 The Invicta continued with the 269cc two-stroke Villiers engine, which was then joined by 346cc and 678cc sv JAP, plus 499cc Abingdon engines. The largest had chain drive. 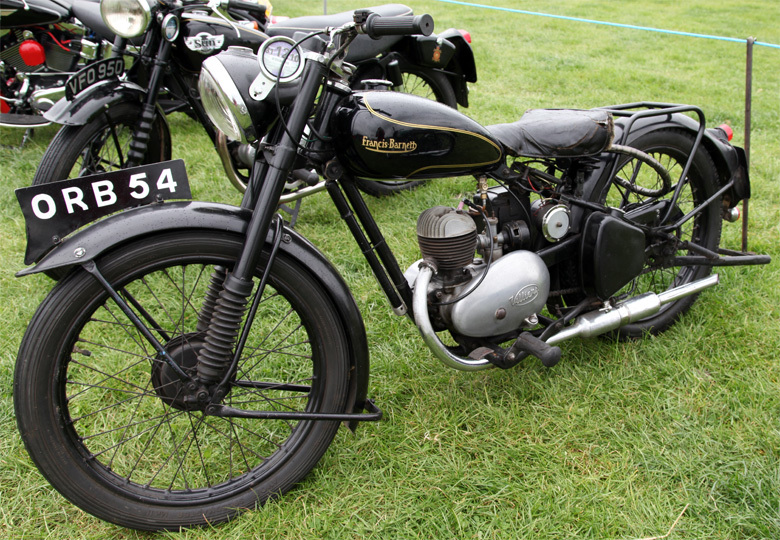 1923 The range had reduced to 247cc Villiers, and 292cc and 346cc four-stroke engines. 1924 There were four-strokes only. 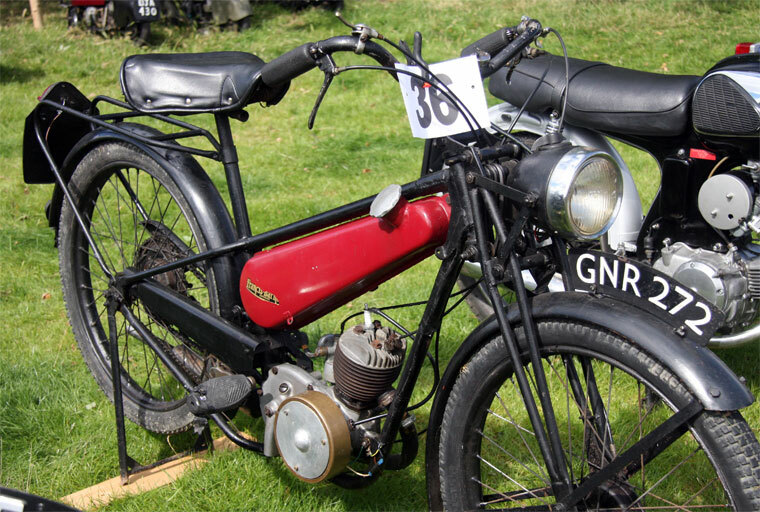 1925 The four-strokes were joined by a 147cc Aza two-stoke. It was to be their final year of production. 1920 The first model was produced using a 292cc JAP engine driving a two-speed gearbox by a chain within an aluminium case and belt final-drive - it also had foot-boards with toe guards, and sprung forks. 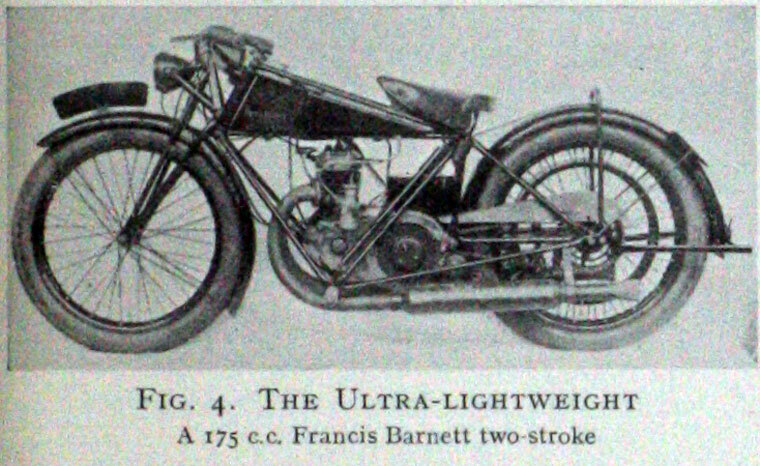 1921 Another model appeared, using the 269cc Villiers engine. 1922 In came a model with a 346cc JAP engine and all-chain drive. 1923 The well-known 'built-like-a-bridge' frame concept was first introduced, having been devised by Gordon Francis. Cheap to make and easy to assemble, it had seven pairs of tubes, all but one of them straight, that bolted up to form a triangular frame. This also allowed the bikes to be taken apart for shipping and the company advertised that it could be re-assembled in 20 minutes (a fact that was recorded on film). 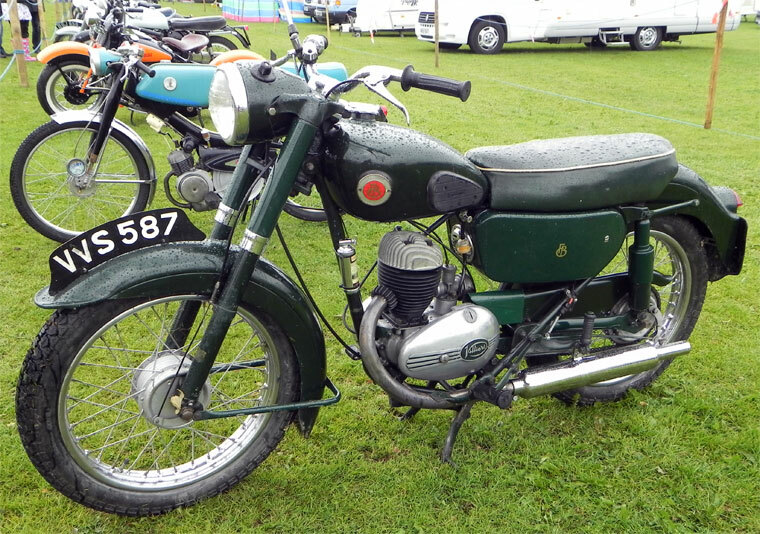 It used a 147cc Villiers engine which resulted in a very cheap and popular machine. The frame was guaranteed against breakage forever. 1924-1926 Various models were added to the range including those for Sports and Touring. The JAP engine capacities were of 147cc, 172cc, 175cc and 346cc. The 175cc model was sold as the Aza. 1927 Only two-stroke models were made during that year, plus the limited production Pullman with its unusual design whereby the cylinders and crank-shaft were set along the frame to drive the three-speed gearbox, built in-unit, with a worm drive to a shaft carrying the final-drive sprocket. The Pullman had a 344cc vertical-twin Villiers engine, made specially for Francis-Barnett, but production was limited. 1928 The range remained the same. 1929 The Pullman had gone, but 196cc and 247cc models were added. 1930s The new decade brought new models and, in particular, the Cruiser. It had a new frame design and an enclosed engine, gearbox and rear chain, using panels that left just the cylinder in view. For the rest of the decade, the firm produced mainly two-strokes. These had names such as Merlin, Kestrel, Lapwing and Plover. 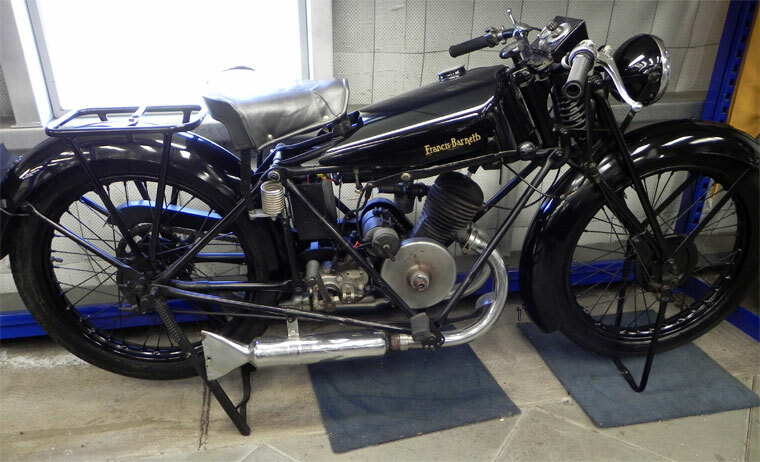 1935 They offered a four-stroke fitted with a 247cc Blackburne engine that had crossed push-rods. It was listed for three years as the Stag. 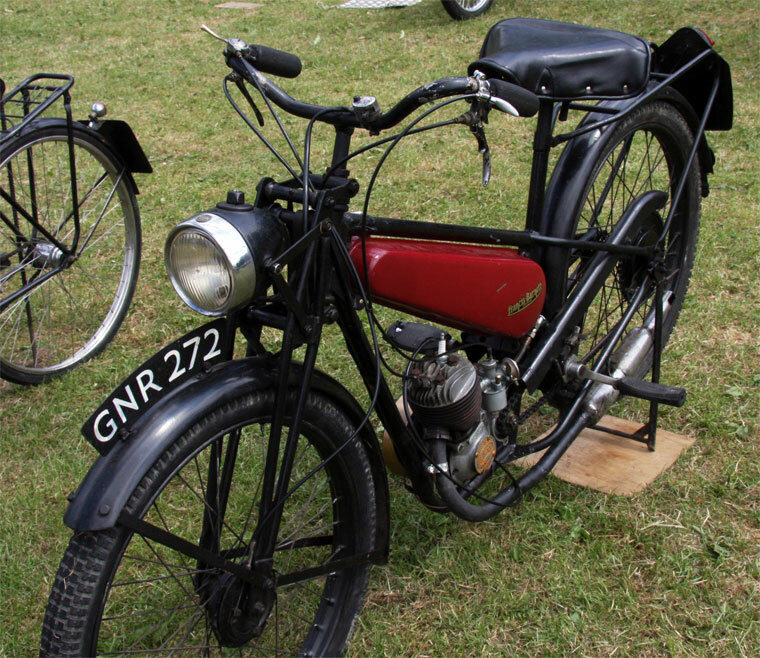 1940 Following World War II, the company produced only two models - the Powerbike and the Merlin. 1949 The range expanded and over the next few years all the motorcycles went over to telescopic forks. 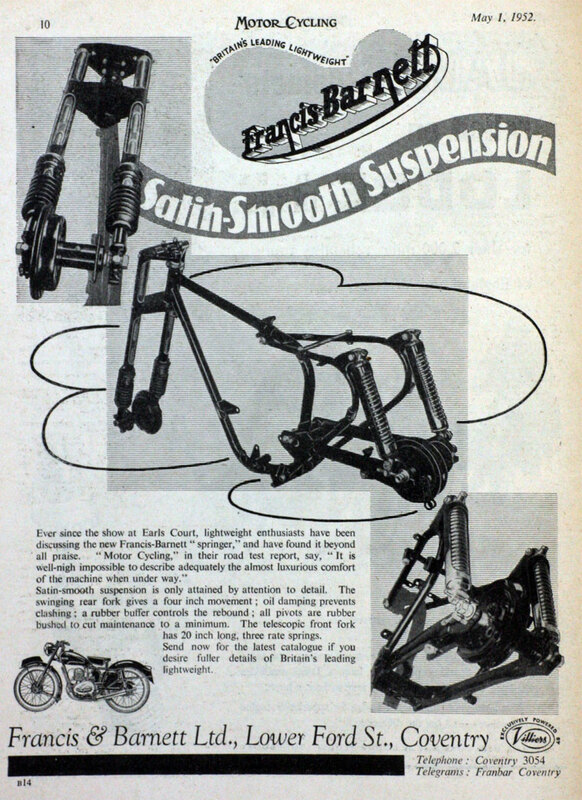 1952 Pivoted-fork rear suspension first appeared, as did the firm's first competition models. 1954 The Cruiser name was revived and used for a 224cc model, which had a frame incorporating pressed members, but without the enclosure. 1957 The company was forced (together with James) to fit the new 249cc AMC engine into the Cruiser. The design of this engine was not as reliable as the Villiers and its troubled performance affected its success. 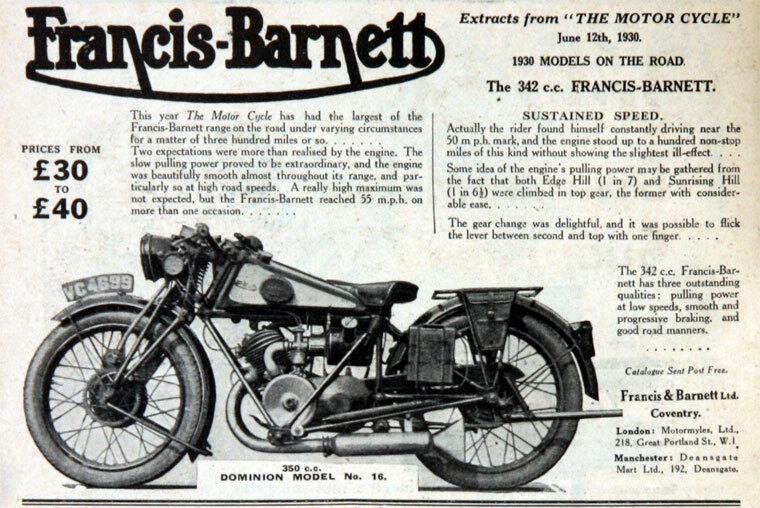 Gradually all Villiers engines used on Francis-Barnett models were replaced by AMC. 1959 A second Cruiser appeared that had the entire rear-end fully enclosed, even the pillion rests folding flush, and leg-shields as standard. 1962 Villiers engines were once again used in some models, and in particular on the Cruiser Twin and the newly-styled Fulmar with a spine frame, leading-link forks, pressed-steel bodywork and the 149cc AMC engine. 1964 The same AMC engine went into a single-tube spine frame to produce a restyled Plover. 1966 The Plover was replaced by a simple, basic model. The parent company had major financial problems and this brought the end of both Francis-Barnett and James in the October of that year. This page was last edited on 12 June 2014, at 17:35.